The journey of blended motherhood can be completely overwhelming and utterly beautiful. Somehow pain and joy coexist. One day we feel like oh yeah, I got this and the next we feel like crying in the bathroom with a pint of ice cream. In this daily struggle, it can often seem like we are losing ourselves. In my experience, entering into a blended family dynamic shook me to the core of my identity. Before embarking on this adventure, I actually had a measure of confidence in my mothering abilities. After all, my biological daughter seemed to be doing fairly well, all things considered. I was thankful for God’s grace while still confident in my natural bent towards mothering. I joyfully embraced the stepmother role. However, it did not take long for me to realize I was in over my head. All of a sudden I was not so confident in my natural abilities. The more I struggled, the more I felt completely lost. The ground underneath me no longer seemed secure. I pressed onward, attempting to make sense of this loss of a sense of internal significance. It was a challenging first year and a half of slogging through what felt like emotional mud at times. I genuinely believed I wasn’t making a difference. I knew in my brain that it takes time for relationships to thrive, yet my heart told me there was something wrong with me. Things would be going so much better if only I was better. During this season, I realized that we can be so incredibly mean to ourselves. We say things to ourselves that we would never think to say to another mother. As we repeat these lies to ourselves, our souls get weighed down. In my experience, it was similar to attempting to walk forward surrounded by a cloud. When we are in these moments of the shadows, Our Father is there. He has given us keys to our freedom not only in His word, but also in the people He has put around us. If we will take a pause and be willing to humbly ask for help, He is there! Often, it is simply a matter of the smallest change in perspective and we see His Love right before us. As I cried out and sometimes screamed at Him (and others), He met me. Gently, He spoke to my heart of His love. Some of the keys I discovered in my journey were my pastor, his wife and my husband. I knew I needed help beyond my own thoughts. I reached out and asked to meet with my pastor. Also, I shared more vulnerably my struggles with my husband instead of holding it tight inside. By opening up these wounds in my heart it brought light to the dark areas. Through the process of shedding light on my inner confusion, truth began to replace those lies. Our value is not found in the roles we fulfill. It is found in the foundation that we are daughters of the Most High God. Whether we are sisters, wives, mothers, friends, employees, employers, etc… that is not our identity! We are the apple of our Father’s eye! He only thinks good thoughts concerning us. His kindness towards us is magnificent! I began to speak to my heart the truth that He had given me as a gift to all of my children. That was a turning point for me. On those days when my house is in shambles and I wish I hadn’t just yelled at my children, I need to take a pause and remind myself of where my value rests. It is a continual process of growth in learning to be kind to this Daughter of the King. As Mom’s, let’s pause even for a couple seconds to catch our breath in His goodness. He will meet us in the trenches of blended motherhood with the wisdom we need. I urge you, fellow amazing mothers, Be Kind to Yourself. This can come in many different ways: saying a quick prayer; journaling; calling a Pastor or encouraging friend; going for a walk; reading a book; getting a massage, taking a rest; getting lunch with a friend or listening to a song. Might I suggest a wonderful song by Andrew Peterson, the lyrics of which I have listed below. Remember first and foremost you are a beloved child of an incredibly Loving God! Has there been times on your blended family journey where you felt overwhelmed as a Stepmom? How was this blog helpful? What are some practical tools that you will utilize moving forward? The Better Than Blended Digital Magazine Edition 2 is on the way! Have your read the first Edition? If not, get your FREE copy today while you wait on our next Edition to be released. We can tell you that you won’t be disappointed! Share a copy with a friend (or 5)! Brad and Julie are a newly blended couple. They have been married since May of 2016. After Brad walked through the pain of being widowed with two young children in the fall of 2010, he made it a priority to pray for a new wife and mother with his children. Julie became a single mother in June of 2013. Through that experience God drew her back to her faith in Him. 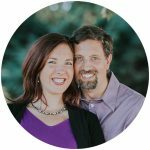 During Brad and Julie’s journey, they sought the Lord for wisdom concerning the future. God, in His tremendous faithfulness used their chapter as single parents to prepare them for a future together.